Stanford Tip B Akut Aortik Diseksiyon Hastalarında Kısa Orta Dönem Tedavi Sonuçlarımız. Amaç: Stanford Tip B akut aortik diseksiyonu (Tip B-AAD) kardiyovasküler hastalıklar içinde yüksek ölüm oranına sahiptir ve tedavisinin karmaşıklığı da önemli bir sorundur. Hastalığın tedavisinde diseksiyonun süresi, komplike ya da unkomplike olması belirleyici rol oynamaktadır. Bu çalışmada Tip B akut aortik diseksiyon sebebi ile takip ve tedavi ettiğimiz hastaların sonuçlarını değerlendirdik. Gereç ve Yöntem: Çalışma tek merkezli ve retrospektif olarak yapılmıştır. Hastaların tedavi stratejisi diseksiyonun akut, kronik olması ve komplike ya da unkomplike olmasına göre belirlendi. Hastalar medikal, TEVAR ya da açık cerrahiyle tedavi ve takip edildiler. Hastalara ait mortalite ve morbidite sebebleri kaydedildi. Bulgular: Toplamda 23 hasta Tip B akut aortik diseksiyonu sebebi ile tedavi edildi. Hastaların yaş ortalaması 58.21±14.17 yıl idi. Takip edilen hastaların büyük çoğunluğu medikal tedavi 16 (%69.5) ile takip edildi. TEVAR tedavisi ile takip edilen hastalar ise ikinci sıklıktaydı. TEVAR hastaları 5 (%21.7) oranında idi. İki hasta ise açık cerrahi ile tedavi edildi. Otuz günlük sağkalım 20 hastada (%86,9) oranında gözlendi. Toplam mortalite ise 3 hastada (%13) oranında görülmüştür. Tartışma: Tip B-AAD ile başvuran hastaların yaklaşık %25'i hastaneye malperfüzyon sendromu veya hemodinamik instabilite ile başvurmaktadırlar. 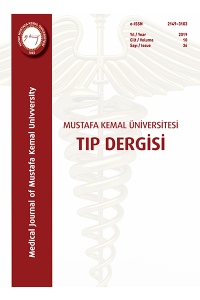 Organ malperfüzyonu ve hemodinamik instabilite bu hastaların ölümlerinde en önemli sebeblerdir. Bundan dolayı hastalığın erken tanısı ve optimal tedavisi hayat kurtarıcı olmaktadır. Tip B-AAD sebebi ile tedavi edilen hastalar unkomplike tipte ise konvansiyonel medikal tedavi ön plandadır. Komplike hastalarda ise TEVAR tedavisi ya da açık cerrahi önerilmektedir. Bizim 23 hastadan oluşan hasta grubumuzdaki toplam mortalite oranımız 3 (%13) hastada oranında görülmüştür. Böbrek yetmezliği ve pleji oranları ise %4.3 oranında saptandı. TEVAR hasta grubunda mortaliteye rastlanmadı. Sonuç: Sonuç olarak Tip B-AAD hastalarının tedavisinde unkomplike tipteki hastalar için öncelikle konvansiyonel medikal tedaviyi öneriyoruz. Komplike tipteki hastalarda TEVAR tedavisini öneriyoruz. TEVAR için gerekli ekipman temin edilemediği acil durumlarda ise açık cerrahiyi öneriyoruz. Aim: Stanford Type B acute aortic dissection (Type B-AAD) has a higher mortality among the cardiovascular diseases and the complexity of its treatment is an important challenge. The duration of dissection, whether it is complicated or uncomplicated play a determinant role in the treatment of the disease. In this study, we evaluated the results of the patients that we followed and we treated due to the Type B acute aortic dissection. Materials and Methods: The study was conducted in a single center and retrospectively. The treatment strategy of the patients was determined with respect to be acute or chronic and to be complicated or uncomplicated. The patients were treated via medical treatment, thoracic endovascular aortic repair (TEVAR) or open surgery and then they were followed. The mortality and the morbidity causes of the patients were recorded. Result:Totally, 23 patients were treated due to Type B acute aortic dissection. The mean age of the patients was 58.21±14.17. The majority of the followed patients (16 patients (69.5%)) were followed with medical treatment. The patients who were followed with TEVAR treatment were in the second rank. The number of the TEVAR patients was 5 (21.7%). Two patients were treated with open surgery. 30-day survival was observed in 20 (86.9%) patients. The total mortality was seen in 3 (13%) patients. Conclusion: The twenty five percent of the patients who refer due to Type B acute aortic dissection admit due to malperfusion syndrome or hemodynamic instability. Organ malperfusion and hemodynamic instability are the most important causes of deaths of these patients. Hence, the early diagnosis of the patient and its optimal treatment is life-saving. If the patients who are treated due to the Type B acute aortic dissection are in uncomplicated type, medical treatment is in the forefront. In complicated patients, TEVAR or open surgery are recommended. In our Type B acute aortic dissection group which consists of 23 patients, the total mortality ratio was seen in 3 (13%) patients. The ratios for renal failure and for plegia were found as 4.3%. In thoracic endovascular aortic repair, no mortality was found. In conclusion, we primarily recommend conventional medical treatment for the patients in uncomplicated type in the treatment of the Type B acute aortic dissection patients. In the patients in complicated type we recommend TEVAR treatment. Since the necessary equipment for the TEVAR could not be ensured, we recommend open surgery for the emergency cases. Qin YL, Wang F, Li TX, Ding W, Deng G, Xie B, Teng GJ. Endovascular repair compared with medical management of patients with uncomplicated type B acute aortic dissection. Journal of the American College of Cardiology. 2016;67:2835-2842. Scott AJ, Bicknell CD. Contemporary management of acute type B dissection. European Journal of Vascular and Endovascular Surgery. 2016;51:452-459. Fattori R, Cao P, De Rango P, Czerny M, Evangelista A, Nienaber C, Rousseau H, Schepens M. Interdisciplinary expert consensus document on management of type B aortic dissection. Journal of the American College of Cardiology.2013;61:1661-1678. Steuer J, Björck M, Mayer D, Wanhainen A, Pfammatter T, Lachat M. Distinction between acute and chronic type B aortic dissection: is there a sub-acute phase? Eur J Vasc Endovasc Surg. 2013;45:627-631. Afifi RO, Sandhu HK, Leake SS, Boutrous, ML, Kumar III V, et al. Outcomes of patients with acute type B (DeBakey III) aortic dissection: a 13-year, single-center experience. Circulation. 2015;132:748-754. Fattori R, Tsai TT, Myrmel T, Evangelista A, Cooper JV,et al. Complicated acute type B dissection: is surgery still the best option? : a report from the International Registry of Acute Aortic Dissection. JACC: Cardiovascular Interventions. 2008;1:395-402. Trimarchi S. Eagle KA, Nienaber CA, Pyeritz RE, Jonker FH,et al. International Registry of Acute Aortic Dissection (IRAD) Investigators. Importance of refractory pain and hypertension in acute type B aortic dissection: insights from the International Registry of Acute Aortic Dissection (IRAD). Circulation. 2010;122:1283-9. Numan F,Gülşen F, Arbatlı H, Yılmaz O,Solak S. Akut komplike tip B aortik diseksiyonların endovasküler tedavisi. Türk Göğüs Kalp Damar Cer Derg.2011;19:41-45. Eggebrecht H, Lönn L, Herold U, Breuckmann F, Leyh R, Jakob HG, et al. Endovascular stent-graft placement for complications of acute type B aortic dissection. Curr Opin Cardiol. 2005;20:477-83. Hagan PG, Nienaber CA, Isselbacher EM, Bruckman D, Karavite DJ, Russman PL, et al. The International Registry of Acute Aortic Dissection (IRAD): new insights into an old disease. JAMA. 2000;283:897-903. Erbel R, Alfonso F, Boileau C, Dirsch O, Eber B, Haverich A, et al. Diagnosis and management of aortic dissection. Eur Heart J. 2001;22:1642-81. Estrera AL, Miller CC 3rd, Safi HJ, Goodrick JS, Keyhani A, Porat EE, et al. Outcomes of medical management of acute type B aortic dissection. Circulation. 2006;114:384-9. Yılmaz O, Arbatlı H, Numan F,Ardal H, Yağan NE,Gülşen F, Sönmez B. Akut komplike tip B aort diseksiyonlarında endovasküler tedavi: İlave işlemler. Türk Göğüs Kalp Damar Cerrahisi Dergisi. 2014;22: 312-319. Zeeshan A, Woo EY, Bavaria JE, Fairman RM, Desai ND, Pochettino A, Szeto WY. Thoracic endovascular aortic repair for acute complicated type B aortic dissection: superiority relative to conventional open surgical and medical therapy. J Thorac Cardiovasc Surg. 2010;140 :109 -15. Li FR, Wu X, Yuan J, Wang J, Mao C,Wu X. LI, Fu-Rong.Comparison of thoracic endovascular aortic repair, open surgery and best medical treatment for type B aortic dissection: A meta-analysis. International journal of cardiology. 2018;250:240-246.